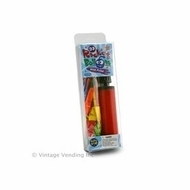 The Rocket Balloon Fun Set gives you 30 reusable rocket balloons and a two-way action pump. These sets make great birthday and holiday gifts for girls or boys. Grandchildren will race to the phone to thank Grandma and Grandpa once they receive this exciting toy in the mail.Keep an extra set in your closet for that last minute emergency gift. They are always a hit.Rocket Balloons make a safe alternative to fireworks on the 4th of July and adults have a great time letting them fly in-doors on New Years Eve. Regardless if it is a family gathering church outing company picnic or birthday party if there is a large group of people they are all going to want to play with these great balloons. Make sure you have extra pumps and balloons on hand so you don't slow down the fun!